jumbobearsports has no other items for sale. 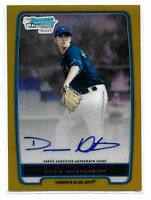 DREW HUTCHISON 2012 BOWMAN CHROME BLUE REFRACTOR #/150 AUTOGRAPH AUTO + 2 MORE ! $0.50 shipping for each additional eligible item you buy from jumbobearsports.